I got interested in bulbs when I was 13. I had purchased Iris × hollandica 'Purple Sensation', Iris × hollandica 'Mix' , Dracunculus vulgaris and Arum italicum from a mail order company. The arum rotted out, the dracunculus was Sauromatum guttatum, but I didn't give up. The next year I bought more. After a few years our home garden in the middle of the Hungarian Great Plain became overcrowded, so I moved to relatives. Within a decade I managed to collect more than 150 tulip varieties, 30 daffodil varieties and some other bulbs. I became interested in perennials too in 2004. By 2006 I had more than 800 taxa; soon I realized we didn't have more space and I don't have that much time. After years of education, I became a professional horticultural engineer, and realized that less is more. In 2008 I had the luck to work as an intern in southern Holland. Every weekend I jumped in my car and went to Keukenhof in Lisse with my camera. The same year I went back to university and graduated as a Plant Doctor. 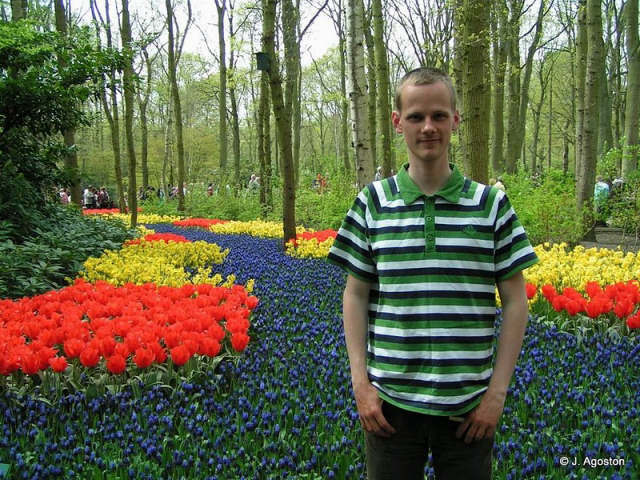 Photo below shows me in front of a bed of Muscari latifolium at Keukenhof. In the background, the red tulip is Tulipa fosteriana 'Rob Verlinden' and the yellow narcissus is Narcissus cyclamineus 'Tete-a-Tete'. I was also an intern in northern Ohio for 4 months. Now I live in Hungary. If I had to summarize my life in a sentence, I would say: "My work is my hobby, that is, plants."